Food Costs > How Much Does Ahi Tuna Cost? How Much Does Ahi Tuna Cost? 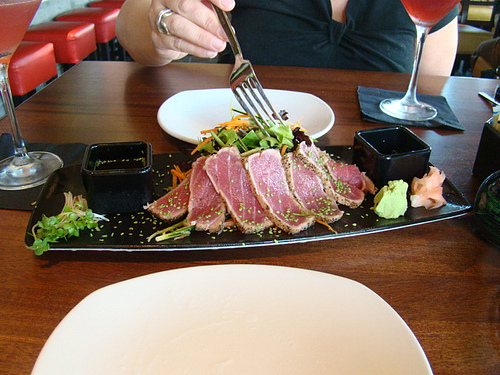 The Yellowfin Tuna, often marketed as the Ahi Tuna, is widely used in raw fish dishes, especially sashimi. This is a migratory fish located in tropical waters, and the word “Ahi” refers to the Hawaiian term for fire. It is also good for grilling and is often served seared rare. This fish is part of the larger tuna species, which can reach weights as high as 400 pounds. There are different cuts of Ahi tuna sold on the market, and the price can be different depending on how much the fish weighs. Ahi Tuna will more than likely come in packs that range anywhere from 4 to 12 pounds, and on average, it can range anywhere from $22 to as much as $30 per pound, depending on the grade. For example, a sashimi grade tuna steak that can be cooked or flash frozen, allowing the fish to lock the deep, rich, fresh flavor, can be purchased for $100 to $150 for 8 steaks that can weigh up to 4 pounds. Giovanni’s Fish Market, for example, sells Ahi tuna online any guarantee their product is sold fresh, not frozen. The fish they sell are flown from Hawaii overnight and have different characteristics such as a purplish flesh and sweet meat, retailing for about $25 to $30 per pound. This fish has two popular grades: “sashimi grade” and other. Those who purchase will either eat it raw if it’s a sushi grade or lightly seared on the grill with a pinch of seasoning. It’s known to have a mild flavor and a firm texture. A 3.5-ounce portion will have 108 calories, 43 grams of cholesterol, 32 mg of sodium, 21 grams of omega-3 fatty acids and 24 grams of protein. Ahi tuna, when found in a retail-like setting, will be either sold low grade frozen, vacuum sealed, prepacked or even canned. If purchasing online, additional shipping fees may apply if it already isn’t tied into the price. If purchasing online, some stores may have a minimum order requirement. The average serving size, according to the Seattle Fish Company, is a half pound per person. If you plan on eating fish for raw consumption, always refer to label for terms such a “wild caught” or “previously frozen” if purchasing in a retail store. Fish will always be flash frozen to prevent people from getting sick when in transport. This shouldn’t be a problem, however, if you were to purchase straight from the docks fresh.